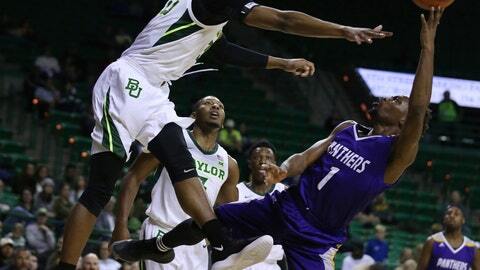 WACO, Texas (AP) — Jared Butler is starting to feel comfortable on the court with Baylor. The true freshman, who originally enrolled at Alabama last summer before transferring to Baylor in August, scored 22 points and King McClure added 21 points with five 3-pointers Monday night, when the Bears finally pulled away late to beat Prairie View 91-80. Butler got an NCAA waiver to play immediately at Baylor, where he had 11 points while making only 4 of 13 shots his first two games. The 6-foot-3 guard broke out against Prairie View by hitting 7-of-10 shots with three 3-pointers and started a game-turning run. The Bears (2-1), who opened their season last week with a loss to another SWAC team, never trailed and led by as many as 16 points in the first half. But their lead was only 59-57 left with 9½ minutes left before a 22-8 run that included a run of 13 consecutive points. Butler scored the first six points in the 13-0 run, including two free throws, a jumper and a layup. McClure then had a 3-pointer and a layup before Tristan Clark emphatically closed out that 2½-minute spurt with a block at one end and a two-handed dunk at the other to make it 78-61. Clark had 17 points on 5-of-5 shooting, along with seven rebounds and five blocked shots. Devonte Bandoo scored 16 points. McClure also had eight rebounds. Prairie View (1-1) had five players in double figures, led by Gary Blackston’s 18 points. Darius Williams had 16, and Gerard Andrus posted 14 points and nine rebounds. Chancellor Ellis had 12 points, and Taishaun Johnson 11. Prairie View: Despite being Prairie View’s second-leading scorer, Williams was a nonfactor for most of the game. He picked up another quick foul after the technical he got following consecutive 3s to start the game. He played only 10 minutes and didn’t score again until the 2:29 mark of the second half. … The Panthers were 11 for 22 from beyond the arc, which allowed them to stay in the game. Baylor: The Bears’ size advantage in the paint showed up with nine blocks, but they only had a 32-31 edge on the boards. Baylor kept Prairie View without a 2-point basket for nearly 11 minutes, shot 61 percent (31 of 51) from the field and 48 percent (11 of 23) on 3s. Baylor opened its season with three consecutive games against teams from the Southwestern Athletic Conference. After losing the opener 72-69 to Texas Southern last Tuesday, their first loss ever to a SWAC team, the Bears responded with a win over Southern University on Saturday before beating Prairie View. The Bears are 58-1 all-time against the SWAC, 15-0 against Prairie View. This was Baylor’s last SWAC opponent. Prairie View A&M will continue its season-opening 12-game road trip against Texas-Rio Grande Valley on Wednesday. Baylor will close out a four-game home stand when it hosts Nicholls State on Friday.